The holidays are here, and for a lot of people that means sweet treats and fantastics feasts are on the horizon. Whether you’re heading to your Mom’s for a holiday ham or trying to navigate the buffet at the work Christmas party, the holiday season can be tough on your waistline, but it can also be difficult on your esophagus if you suffer from acute or chronic acid reflux. We’re not saying you have to avoid snacking or indulging in some holiday favorites, but if you suffer from regular heartburn, staying clear or limiting yourself when it comes to these four food and beverage options is a smart decision. Here’s a look at four holiday favorites to avoid if you have acid reflux. 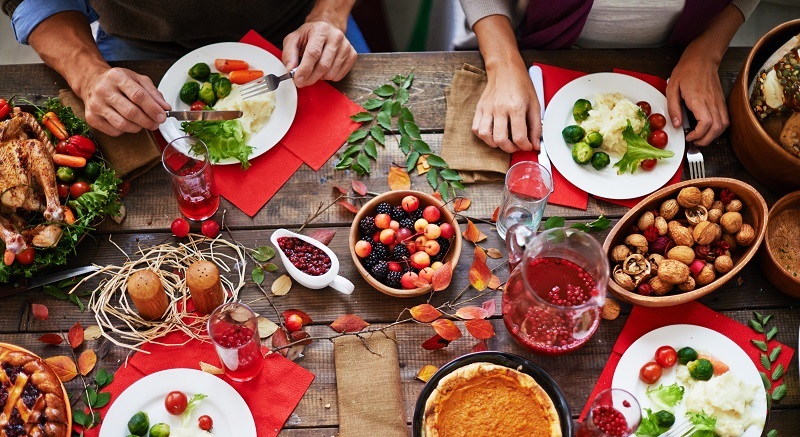 If you have gastroesophageal reflux disease or acid reflux, you’ll want to steer clear of these four food options throughout the holidays. Chocolate – Cocoa powder in chocolate is acidic, which can cause heartburn symptoms to increase. The cocoa can cause the intestinal cells that relax your esophageal sphincter to release extra serotonin, further relaxing the esophageal sphincter. This can prevent it from creating a tight seal, which in turn can allow stomach acid back up into the esophagus and lead to heartburn. You don’t need to avoid all chocolate this holiday season, but consider eating it with a meal so the effects of the cocoa powder aren’t isolated. Peppermint – Leave the peppermint sticks for old St. Nick, because peppermint can also lead to a triggering of heartburn symptoms. Peppermint can be a trigger food for the same reason cocoa powder can trigger an attack, because peppermint relaxes the esophageal sphincter. When the ring is relaxed, stomach acid can make its way back up your system. Peppermint can have a soothing effect on your stomach, but it can actually trigger an acid reflux attack, so consume it with caution this season. Alcohol – Be wary of the eggnog this year, because alcohol can have a negative effect on your heartburn. Although the research isn’t definitive, there are some findings that suggest alcohol may lead to worsening heartburn. For starters, alcohol can relax the esophageal sphincter, which we’ve already touched on, and one previous study showed that wine can increase the amount of acid in your stomach, meaning a heartburn attack after drinking wine can be more painful than normal. Another study found that individuals who drank beer were more likely to deal with acid reflux symptoms later in the evening than those who stuck to water. If you’re going to drink alcohol, limit yourself to one or two drinks, and try to avoid overly carbonated options. Fatty Foods – Foods that are high in fat, like cheeses and nuts, which may be plentiful at the office Christmas party, can trigger a recurrence of acid reflux. That’s because high fat foods slow down our stomach’s ability to empty itself, which can leave stomach acid in the area longer and put more pressure on the esophageal sphincter. Don’t load up on these high fat snack options, or you may end up feeling bloated and dealing with acid reflux. For more tips on how to survive the holiday season if you have heartburn, or if you want to talk to Dr. Koeplin about your esophageal discomfort, reach out to his office today.